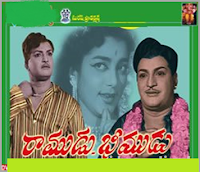 Ramudu Bheemudu is a 1964 Telugu film. It was the first hit movie of producer D.Rama Naidu. N.T.Rama Rao played first time the dual role as Ramudu and Bheemudu. It was remade into Hindi Ram Aur Shyam (1967) starring Dilip Kumar.